Bird Island was discovered by Captain James Cook in 1775, who sighted and named Bird Island “on account of the vast numbers [of birds] that were upon it”. The uninhabited Willis Islands, 3.2km west of Bird Island, were also named during this expedition after the first crew member who sighted the islands. Sealers were present throughout South Georgia in the late 19th century and signs of their presence on Bird Island is seen in the Sealer’s Cave, beneath Cave Crag, close to Freshwater Beach. Intermittently 1957 – 1982. Continuously 22 Sep 1982 – present. It was used by summer parties from 1957-64 and from 1971-82. Personnel were evacuated on 1 Apr 1982 by HMS Endurance following the Argentine invasion of South Georgia. Reopened on 22 Sep 1982 after cessation of hostilities. Jordan Cove was used by summer parties from 1957 to 1964 and from 1971 to 1982. 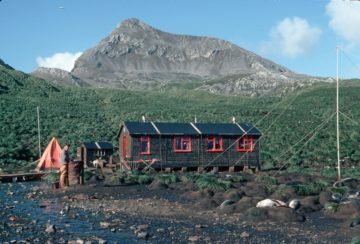 The first permanent hut was established on 24 November 1958 by the Falkland Islands Government. It was known as Bonner’s Bothy, after W N Bonner, biologist from 1953 to 1986 and BAS Deputy Director between 1986 and 1988. In December 1962 the United States Antarctic Research Program (USARP) established two huts that were later used by BAS. 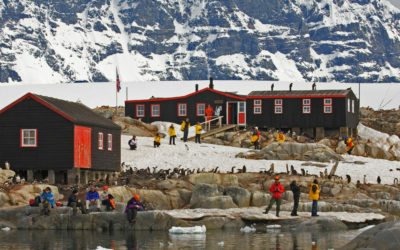 One of these, used as an accommodation hut, was known as Lönnberg House after the Swedish biologist Einar Lönnberg who expressed great concern at the amount of sealing and whaling on South Georgia in 1906. A new hut was constructed in October 1981 for wintering staff. Following the Argentine invasion of South Georgia, the first wintering party were evacuated on 1 April 1982 by HMS Endurance. The base was re-opened on 22 September 1982 following the cessation of hostilities. 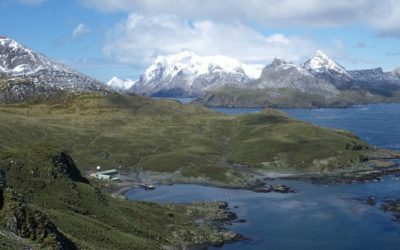 The new building was named Beck House after Rolla Howard Beck, an American biologist who made extensive collections of birds around the Falkland Islands, Tierra del Fuego and the Galapagos Islands between 1912 and 1917. This building provided accommodation, laboratory and office space for up to eight people. A further building containing laboratories, a workshop and storage areas was added in the 1995/96 season. An extension to Beck House was established a year later in the 1996/97 season, housing upgraded accommodation (double bedrooms). Other improvements included an improved water collection and treatment system. To commemorate Pete Prince, BAS seabird biologist between 1971 and 1998 and Officer in Charge of Bird Island Station from 1993 to 1998, the newly extended Base was renamed Prince House in 1998–99. The storage building was then named Beck House. The station complex was completely redeveloped between Jan and June 2005 by Morrison PLC, construction partners of BAS. The new building, occupied from June 2005, was named Prince House. The older building of that name was demolished in Nov 2005 and the site cleared in Jan 2006. The old generator shed (the original Lonnberg / Beck House ) was demolished to make way for the current Prince House and a new generator and fire pump building situated between Beck House and the jetty was built. Field huts and hides have existed at one time or other at the following sites: Gazella Peak, Molly Hill, Wanderer Ridge, Johnson Gentoo Colony, Top Meadows (two locations), Colony B, Special Study Beach, Colony J and Fairy Point.